Exotic handbags have evolved from a luxe fashion fad to an invaluable wardrobe staple. 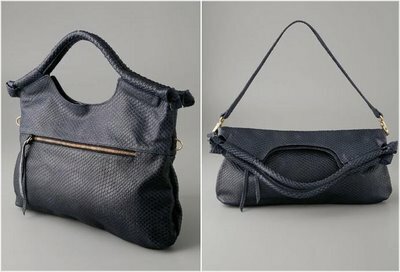 Now more and more women want to add these beautiful, luxurious and expensive bags to their fashionable collections. If a Nancy Gonzalez croc bag is completely out of your budget, as I suspect they are for most women, then embossed leathers will deliver the look if not the feel of the real deal. The Foley & Corinna Embossed Snake City Clutch will certainly fool the untrained eye. This modern design is well-executed. From the clever knot-detailed top handles to the oversize (11 x 17 open and 6 x 17 folded) frame, the 'City' clutch provides just what an urban gal needs in a day to evening bag. With front and back exterior zip pockets as well as two interior pockets, you'll have all the storage space you could possibly need to carry you through the day. The Foley & Corinna City Clutch comes with a removable shoulder strap in case you don't favor carrying large clutches as I don't. It's available in midnight blue, chocolate and beige, but the midnight blue is the most tempting choice of the three.